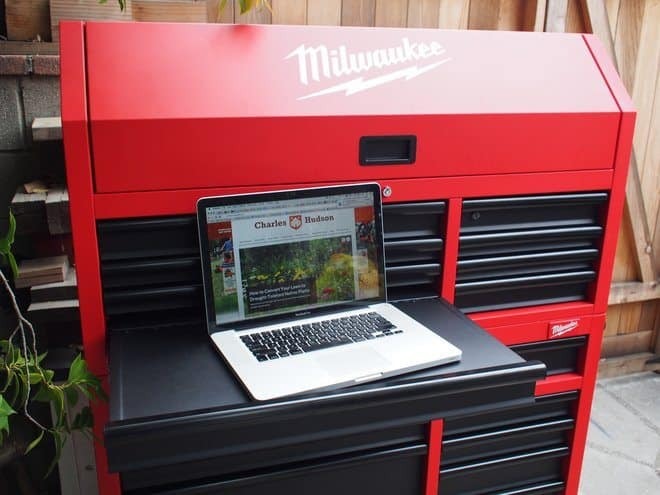 Milwaukee Tool hit a home run last year with their portable tool boxes. 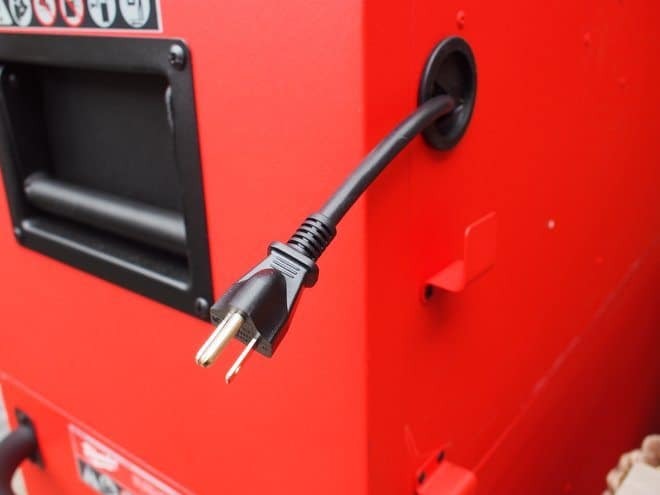 The trades love them as Milwaukee designed and built them to fit the exact needs of lineman, plumbers, carpenters and more. 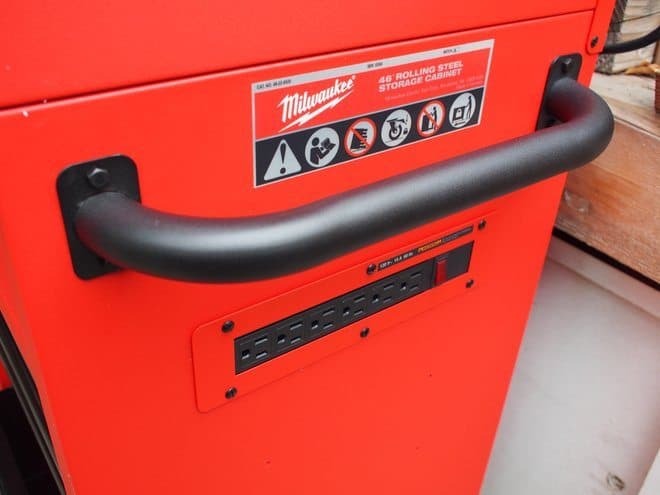 The next step for Milwaukee in tool storage is to deliver a full-size tool chest, which they finally have! 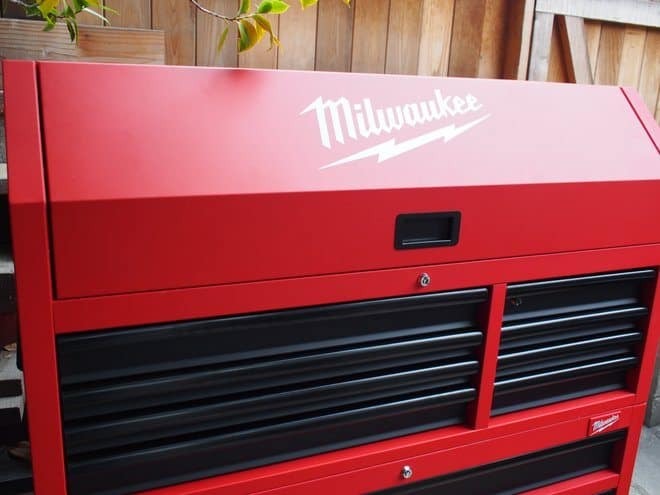 The Milwaukee Tool 46″ Rolling Steel Tool Storage Chest is a sight to behold. It dwarfs our Craftsman 42″ tool chest in every way. 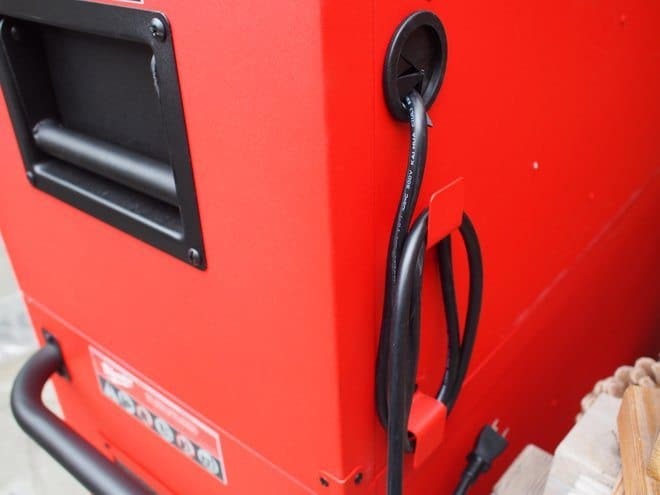 The powder coated red paint leaves no doubt this is a Milwaukee product, which you can see from a mile away. The classic lightning bolt logo is also front and center to show your pride in red tools. Here’s a quick video showing some of the features of this new tool storage chest. The steel construction of this tool chest is solid and we have no doubt it would probably be the last thing standing if there was ever a fire or earthquake. 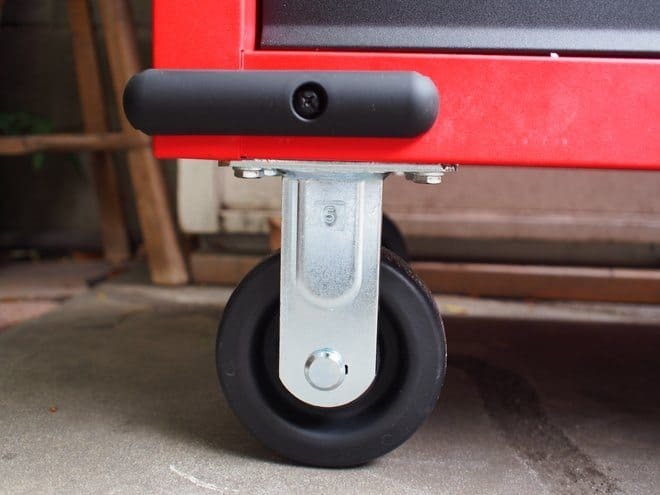 The drawers pull easily and the soft close prevents them from being slammed shut. The whole unit can support 1,800 lbs which is a heck of a lot of tools. Starting at the top, the huge lid opens to reveal a padded work area with a built-in pegboard that can be loaded with tools of your choice. There is also one of two 6 socket power strips located here. Just below the top is a single locking drawer that can be locked separately from the other drawers. The 16 drawers are configured at two lengths and various depths to accommodate a wide variety of hand and power tools. Yes, power tools! 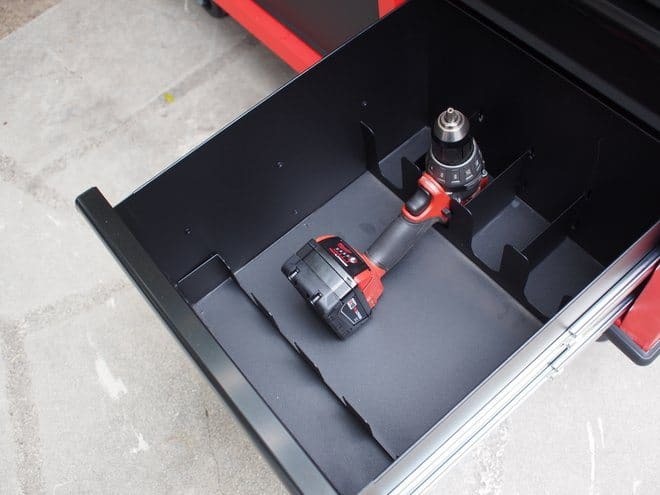 The bottom drawer includes built-in holders for your power tools and batteries. We currently keep our impact driver and drill driver in a flat drawer but they take up a lot of space. By creating a dedicated drawer for these tools, Milwaukee has freed up the top drawers for more hand tools. Back to the pads. 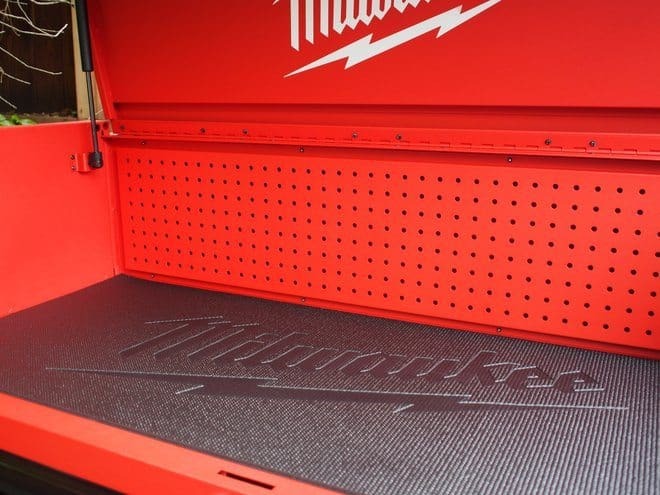 Milwaukee has done us a favor by precutting drawer liner pads for each drawer. 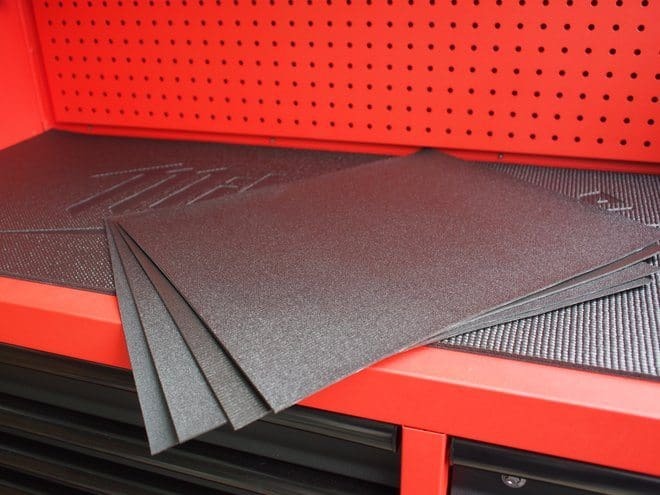 These pads will prevent your tools and accessories from rolling around and provides a nice surface to store your tools. The top pad even has an awesome Milwaukee logo printed on it. 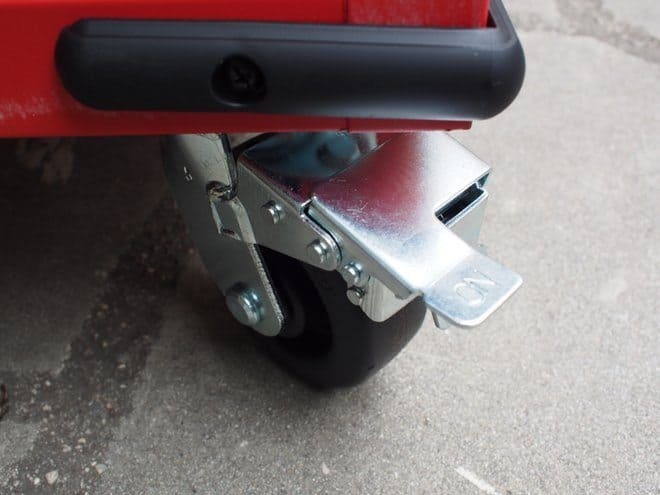 The tool chest rolls in 4 heavy duty caster wheels, two of which pivot and lock which provide plenty of mobility and stability for the unit. The tool chest also doubles as a standing desk and we all know the benefits of standing while working. 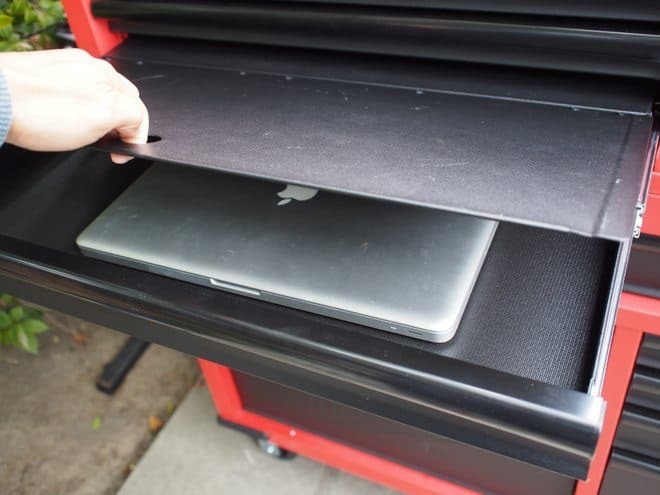 A pull out drawer provides a sturdy platform to place your laptop on and when you are done you can safely store it underneath the work surface. 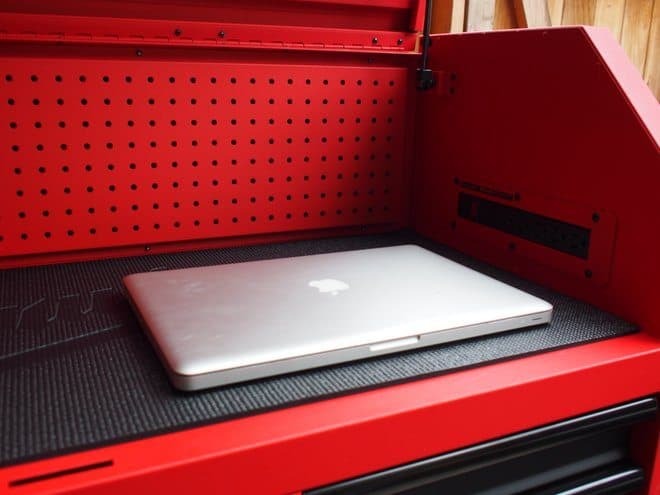 This would come in extremely handy for auto technicians who need a laptop nearby to analyze car chips and audio equipment. 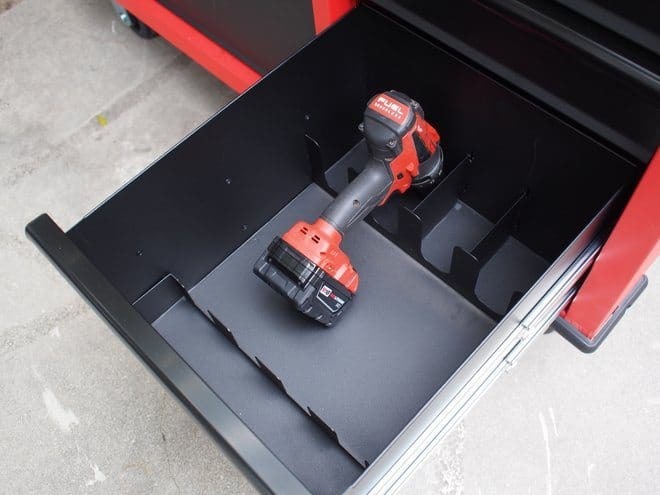 If you’ve got the space, this tool storage chest can fit into any standard garage or home workshop, but it’s best suited for a commercial workshop and built to withstand the rigors of daily use. The one drawback with the storage chest is that the upper portion could be out of reach for someone shorter than 5’5″. They may have difficulty reaching the back of the pegboard or reaching up to close the lid. It comes with a 3 year limited warranty and will be available this month with select retailers.